Serious injuries, like burns, can have life-altering consequences. Because of the nature of this type of injury, however, there is a high risk of complications. At Harris Lowry Manton LLP, we only represent the injured. We know how difficult it can be to live with an injury that leaves you unable to work and provide for your family, and to care for a person who has been catastrophically injured. 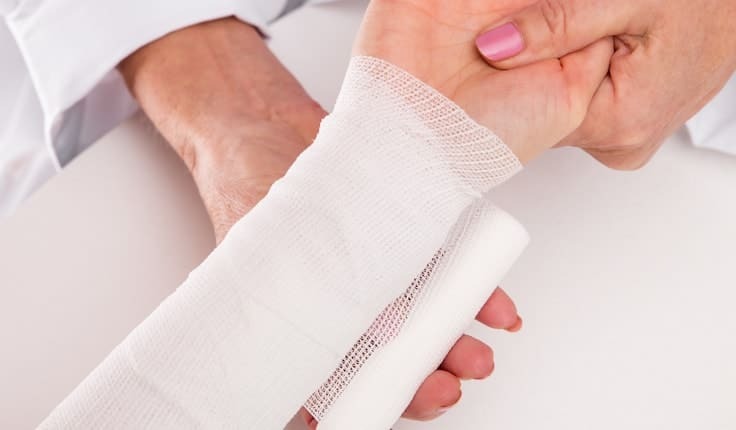 If complications arose as a result of your burn injuries, our Atlanta lawyers can help you protect your family and your future. The type of medical treatment you might need for your burn is directly related to the type of burn you have. A first-degree burn can be treated with cool water (never ice), burn cream or aloe vera, and some loose gauze, to keep the area clean without putting too much pressure on it. Anything other than a first-degree burn should be treated by a medical professional. If you sustain a second-degree burn – the kind with raw, red blisters – you make needs weeks to fully heal. The doctor will wrap the wounds to keep them clean and free from infection, and you may be prescribed antibiotics. If the blisters are severe, you may need skin grafts. Third-degree burns will necessitate a trip to the hospital. These are the third-most serious category of burn injuries. They permeate all layers of skin, and are often dry to the touch. Unlike first- and second-degree burns, third-degree may be painless, because they can damage the nerves. These injuries can lead to a complication called contracture, and often leave permanent scarring. Fourth-degree burns are the most severe types of injuries. They reach down into the tissue, muscles and even the bone. A fourth-degree burn can lead to amputations, and require multiple surgeries. They are the most likely to be fatal. In the U.S., almost half a million people each year will seek medical attention for burns. Approximately 40,000 people are hospitalized for burn injuries every year. Infections. Any time your skin is open, your body is at risk of infection. Burn victims face the risk of sepsis, an inflammatory reaction to an infection, and tetanus, a bacterial infection. Both of these conditions can be deadly if they are left untreated. Blood loss. A body which loses too much blood too quickly is at risk of shutting down. Also called “hypovolemic shock,” severe blood loss can cause permanent organ damage, tissue death or heart attacks, and can be fatal. Temperature regulation. Severe burns can leave your body unable to regulate its own temperature. If your skin fuses to clothing, or if the scarring is too severe, your pores will be unable to release sweat, which means your body cannot cool itself. Severe burns can also cause your body to lose heat, leading to hypothermia. Hypothermia, in turn, can lead to tissue death, and can be fatal. Contracture. Contracture occurs when tissue loses its elasticity. It is a common effect of the severe scarring burn victims suffer. Oxygen deprivation. Inhaling smoke, soot and ash can burn your windpipe. However, if you sustain a burn injury on your neck, your throat can swell shut. You may need a breathing tube in order to survive. If the brain is deprived of oxygen for a minute, its cells begin to die. At three minutes, permanent brain damage is likely. At the five to six-minute mark, brain death becomes imminent. Circulation issues. Severe burns form scabs, called eschar, as they heal. If the eschar is too tight, it can affect your blood circulation. Adult respiratory distress syndrome (ARDS). ARDS is rare condition that causes fluid to collect in the lungs. It prevents oxygen from reaching your organs. It is often fatal, though it can be treated and managed if caught early. It can also do lasting damage to the lungs. Few injuries are more catastrophic than severe burns. You could face a lifetime of needing medical care, and your injuries may make it impossible for you or your loved one to return to work. At Harris Lowry Manton LLP, we fight to ensure that you have access to the resources and tools you need to feel secure after a burn injury. To learn more about our services, or to schedule an appointment, please fill out this contact form, or call our offices directly: 404.998.8847 in Atlanta, or 912.417.3774 in Savannah.